United Passenger Suffered Concussion, Broken Nose, Lost Teeth, Lawyer Says : The Two-Way David Dao, the 69-year-old doctor dragged off a United Express flight on Sunday night, is still recovering from his injuries, according to his attorney, who said there will "probably" be a lawsuit. 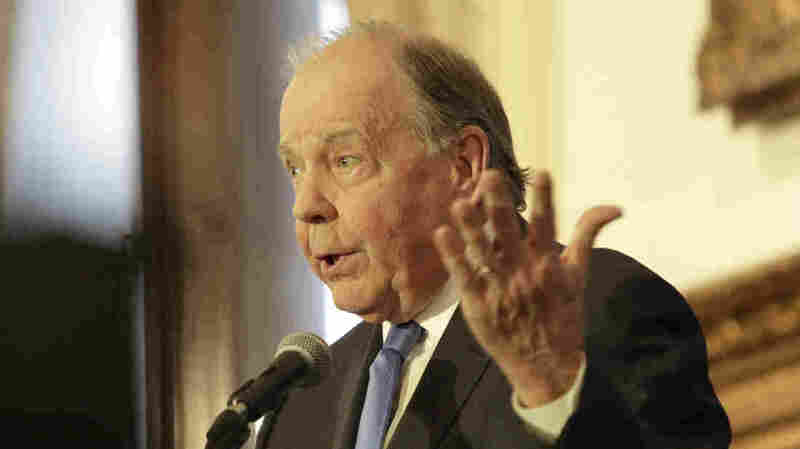 Thomas Demetrio, an attorney for David Dao, speaks at a news conference Thursday in Chicago. Dao was dragged from a United Express flight Sunday after he refused to give up his seat on the full flight from Chicago to Louisville, Ky., to make room for four crew members. Airlines are legally allowed to "overbook" flights, selling more tickets than they have seats. That means in some cases paying passengers are barred from the flight. In Dao's case, the airline originally said the flight was overbooked but later clarified it only became "oversold" when United discovered it had four crew members who needed to be on the flight from Chicago to Louisville, Ky. The airline offered money for anyone who volunteered to leave, and when no one did, they ordered passengers to go. Dao refused, saying he had patients to see, and United called security — leading to a bloody altercation and officers with the Chicago Department of Aviation dragging Dao's limp body down the aisle.